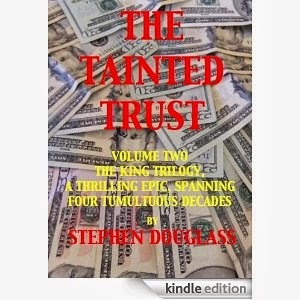 Synopsis: Volume Two of The King Trilogy, The Tainted Trust is, in addition to a moving and action packed thriller, a brilliant depiction of what perfectly normal people will do for love and money. It is the continuing story of an inconvenient fortune and its catastrophic impact on a loving family. Stephen says: I wrote this piece in an attempt to establish a bridge between the first and second trilogy volumes, and to introduce Louis Visconti, an evil individual. I chose this because some time ago, I entered it into an Author of the Week contest and received the following comment from the moderator: "The Tainted Trust by Stephen Douglass has the best mix of dialogue and narrative that I have read thus far." Excerpt: New York. April 23, 1980. Louis Visconti was a happy man. Alone at his massive glass topped desk on the fifty-sixth floor of the south tower of The World Trade Center, he stared pensively in the direction of the window, refusing to allow his steely grey eyes to focus on anything. He reflected on his considerable achievements. Thirty-three years of age, ten years out of Harvard Business School, and already a multimillionaire, he figured his income for the year would be between two and three million, his lofty projection based on annualizing outstanding results of the first half of the year. His personal spending had increased in proportion to his considerable investment successes. With every reason to believe the cash flow would continue forever, there was no need to save. The cost of most anything he wanted was irrelevant. Image and profile were everything. When he threw a party, his only concern was how lavish he could make it. No expense was spared to make certain it was more ostentatious than any he had attended. There were women in his life, but only one of his relationships had ever reached critical mass, the price of love and commitment refusing to allow that threshold to be breached. Money was his real lover, possessions and power his consuming passions. Finally realizing his dream of becoming one of the most important figures in New York's financial community, his picture had not only appeared in the Wall Street Journal and Barron's, but also in the financial sections of most important newspapers in the industrialized world. His brilliant and phenomenal investment record had become legendary. He was the man, in demand. Movers and shakers stumbled over one another to be and seen in his company. His schedule had become so tight that he was compelled to turn down numerous invitations to speak at luncheons, dinners and conventions in North America, Europe and Asia. His brief experience with marriage was an unmitigated disaster, fortunately ending before wealth and children. He was strikingly handsome and extremely eligible, the only child of near penniless Italian immigrants who had fled to the United States in late 1946. He frequently boasted about the source of his survival instincts by claiming that both he and his mother had narrowly escaped death when she gave birth to him within minutes of her arrival at Ellis Island. Blessed with a brilliant mind and fanatical ambition, he had scratched and clawed his way through public and high schools in Queens. Hustling, working and studying hard eventually earned him a near full ticket scholarship at Harvard Business School. His lucky break was to have been offered a full partnership with his two friends and former classmates, Jerry Mara and Allen Griesdorf. Seven years earlier, the three had taken an enormous gamble when they quit the relative security of their jobs as account executives with Green, Waltrum, a large and extremely prestigious Wall Street investment banking firm. With the horsepower of youthful courage and a boatload of borrowed money, they boldly formed their own company. Mara, Griesdorf and Visconti grew quickly. The partners took a pass on ordinary money. They romanced and managed only wealthy money in a single investment fund. From the very beginning they had set an unrelenting minimum per account of five hundred thousand dollars. By investing the bulk of the fat portfolios in tangible assets during the highly inflationary seventies, they had enriched their clients and achieved personal success beyond their wildest dreams. As word of the company’s brilliant investment techniques and incredible track record spread, more clients came, anxious to receive the twenty-plus percent annual return others had enjoyed for five consecutive years. Now that the partners were managing over a billion dollars, the fund had become unwieldy. Closing it and refusing further entry was now well within the partners’ contemplation. Visconti displayed a lecherous smirk as he watched Susan, his secretary, a shapely twenty-eight year old brunette, enter his office. “I have a call for you on line eight,” she announced with a fetching smile, then placed a black coffee mug on Visconti’s desk. “Who is it?” Visconti asked, refusing to shift his grey eyes from Susan’s tantalizing breasts. Visconti bolted upright and immediately began to salivate. “How much?” he shouted. “Visconti completed a quick mental calculation and salivated more. He wondered however, why Schnieder had chosen him. “Why me, Alfred?” he asked. “Elementary, my friend. You are the most qualified,” Schnieder conceded, well aware of Visconti's larcenous tendencies. Many thanks for allowing me to share my excerpt with such accomplished authors. THE TAINTED TRUST: sequel to THE BRIDGE TO CARACAS.